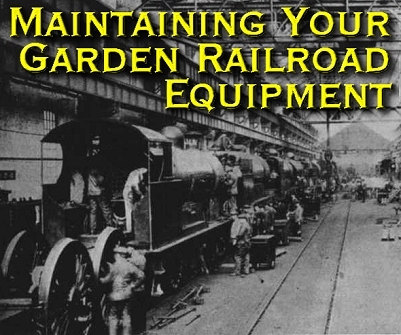 Once you get your garden railroad equipment out of the box, it will begin to need maintenance. Some items, like the Bachmann Shay locomotives, need maintenance (lubrication) even before you set them on the track. Most others will go fine for quite a while before they need work of any kind. But your trains and accessories will work better and look better if you keep them in good condition. In addition, if you want to get "down-and-dirty" technical details on most of the commonly used Large Scale locomotives and rolling stock, refer to George Shreyer's "Technical Tips Page". This page also reviews many power and control solutions for your locomotives, including DCC, Crest/AristoCraft Train Engineer, etc. In fact, George is an expert on several subjects and one of the hobby's most prolific writers. His resources should be important to you as your railroad grows. Do you have any new finds, techniques or recommendation you'd like to add to our information? If you do, especially if you can come up with how-to descriptions and photos, I'd love to post them here. Also, if you know of any free online articles I should provide links to, please let me know and I'll check them out.